Marelle Taylor Stampin' Up! Demonstrator Sydney Australia: Bonus Days Promotion - FINAL DAY! Bonus Days Promotion - FINAL DAY! Today is your last chance to take advantage of the awesome Bonus Days Promotion that is running at the moment! Have you had a chance to place an order from the new Annual Catalogue yet? Like me, you probably still have a gazillion items on your wish list, so I have some great news for you! 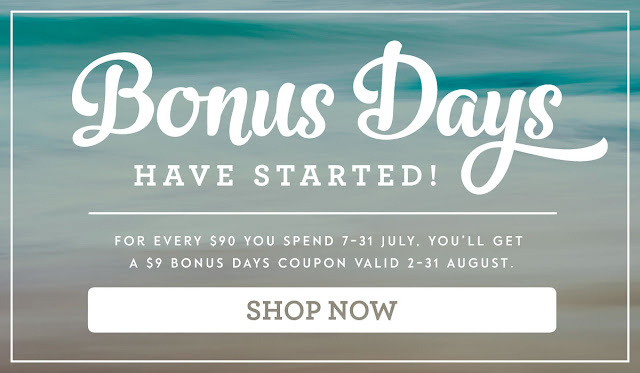 For every $90 you spend between 7 July and 31 July (before shipping and handling), you’ll get a $9 Bonus Days coupon that you can use from 2–31 August. This is a great chance to tick a few things off your wish list...you can buy some of your favourite products now, and a few more later in August with your coupons! It is strongly recommended that participants both save emails containing their Bonus Days coupon codes AND write down the coupon codes in a safe place. Codes cannot be re-sent if the email is lost, and lost codes cannot be recovered.